Sogyal Rinpoche (Tib. བསོད་རྒྱལ་རིན་པོ་ཆེ་, Wyl. bsod rgyal rin po che) — Born into the Lakar family in Kham in Eastern Tibet, Sogyal Rinpoche was recognized as the incarnation of Lerab Lingpa Tertön Sogyal, a teacher to the Thirteenth Dalai Lama, by Jamyang Khyentse Chökyi Lodrö, one of the most outstanding spiritual masters of the twentieth century. Jamyang Khyentse supervised Rinpoche's training and raised him like his own son. In 1971, Rinpoche went to England where he received a Western education, studying Comparative Religion at Cambridge University. He went on to study with many other great masters, of all schools of Tibetan Buddhism, including Dudjom Rinpoche, Dilgo Khyentse Rinpoche and Nyoshul Khen Rinpoche, serving as their translator and aide. With his remarkable gift for presenting the essence of Tibetan Buddhism in a way that is both authentic and profoundly relevant to the modern mind, Sogyal Rinpoche is one of the most renowned teachers of our time. He is also the author of the highly-acclaimed and ground breaking book, The Tibetan Book of Living and Dying. Over three million copies of this spiritual classic have been sold in 34 languages and 80 countries. It has been adopted by colleges, groups and institutions, both medical and religious, and is used extensively by nurses, doctors and health care professionals. Rinpoche is also the founder of Rigpa, an international network of 130 centres and groups in 30 countries around the world offering the Buddha’s teachings through courses and seminars in meditation and compassion, as well as a complete path of study and practice that follows every stage of the Buddha’s teachings. Rinpoche has been teaching for over 40 years in Europe, America, Australia and Asia. He retired as the Spiritual Director of Rigpa in 2017, is currently in retreat and not giving public teachings. Since Sogyal Rinpoche’s retirement, Rigpa continues to offer courses, programmes, seminars and retreats led by its teachers and instructors, as well as visiting teachers and lamas, especially from the 'ancient' Nyingma tradition of Tibetan Buddhism. Sogyal Rinpoche was born into the Lakar family of Trehor, Kham in Eastern Tibet in the Fire Pig year (1947-8). His father was Jamga, a nephew of Dilgo Khyentse Rinpoche, and his mother, Mayum Tsering Wangmo of the Lakar family, was recognized as an emanation of Ushnishavijaya by Khenpo Ngakchung. "At his birth, there were many wonderful signs, such as rainbows arching over the roof of the house, and on that auspicious day there was not the slightest problem of any kind." He was delivered by Ratak Sogyal, the brother of Kalu Rinpoche. Only six months later, the young child was invited to see Jamyang Khyentse Chökyi Lodrö at Dzongsar, the seat of the Khyentses. Whilst on the way, his father Jamga and mother Tsering Wangmo, as well as Ani Pema Lhamo, the male servant Tsering Pépé, the female servant Apé Lhadzom and many others heard him utter his very first words as he recited the vajra guru mantra aloud three times. Khyentse Rinpoche invited the party to join him for a special meal on an auspicious date, and when they went in to see him, everything had been prepared for an enthronement ceremony. As soon as Ani-la saw what was intended, she was amazed and said aloud, “What are you doing? He is the family’s only son. He can not be given away to anyone.” In response, Khyentse Rinpoche wrote a statement in his own hand, in which he clearly identified the boy as a genuine incarnation of Tertön Sogyal." He was also recognized as an incarnation of several other masters, including Do Khyentse Yeshe Dorje, Lingtsang Gyalpo and Desi Sangye Gyatso. "On another occasion, when the family were in Hor, the young Sogyal tulku took three phurbas from under the carpet while he played in his room. His mother and father tried many times to discover whose they were, but noone claimed them, and they became objects of worship. Once, when he was playing in the Guru Rinpoche temple, he was heard shouting, “Come quickly! Guru Rinpoche is standing up!” But before anyone could get there, the Guru Rinpoche statue had sat back down again. The first to arrive later remarked how he had seen Guru Rinpoche’s khatvanga trident still rattling. Sogyal Tulku’s games were not like those of other children. For toys, he would use the ritual instruments from the monastery, and everyone observed how he was always well-mannered and polite." According to Dzongsar Ngari Tulku (Tenzin Khedrup Gyatso), on one occasion [c.1952], when Jamyang Khyentse Chökyi Lodrö was opening the sacred place of Khyungchen Paldzong (Tib. ཁྱུང་ཆེན་དཔལ་རྫོང་, khyung chen dpal rdzong), known locally as Gyalgen Khyungtak (Tib. རྒྱ་རྒན་ཁྱུང་ལྟག་rgya rgan khyung ltag), above Dzongsar Monastery, Jamyang Khyentse, Gyarong Khandro, Khandro Tsering Chödrön and Sogyal Rinpoche all left their handprints in the solid rock. In 1955, Sogyal Rinpoche left Kham, together with his family, Jamyang Khyentse Chökyi Lodrö and around fifty other people, and travelled to Central Tibet. They met the Dalai Lama at the Potala in Lhasa. While in Lhasa, they stayed at the Samdrup Podrang. In 1956 they visited Tsurphu, Mindroling, Samye Chimphu and Lhodrak, where Jamyang Khyentse introduced the young Sogyal Tulku to the nature of mind. At the end of 1956, they arrived in India, and visited Tso Pema and Bodhgaya. In 1957, they stayed mostly in Sikkim, at the Palace Monastery in Gangtok. They once again visited Bodhgaya and Varanasi, where they met the Dalai Lama. In 1958, they spent the summer in Darjeeling, staying at Kuch Behar at the Maharaj's palace. Jamyang Khyentse Chökyi Lodrö passed away in Gangtok on the sixth day of the fifth Tibetan month in the Earth Pig year (1959). "As he was passing away in Sikkim, Khyentse Rinpoche gave instructions that Khenpo Appey should take charge of Sogyal Tulku’s education. When studying with Khenpo Appey, the young Sogyal was always at the head of his class, and came first or second in examinations taken with many other lamas and tulkus." He also studied with Khenpo Lodrö Zangpo and Gyaltön Rinpoche at this time, and learned Tibetan calligraphy from Drungyik Tsering Tashi. "Later, when he attended school [in Kalimpong], he outperformed the other children to such a degree that he used to complete two years’ classes in a single year! Not only that, as he felt compassion and concern for his parents, he chose not to sleep at the school, and when his teachers asked him why he could not stay on the school premises, he replied that his parents were having difficulties, because they had no less than fifty-five old lamas in their care. At one point, the children were told that an important foreign guest would be visiting their school in a few days, and that to mark the occasion they each had to write a special essay. Rinpoche wrote something, which was read by the guest, who immediately asked after its author. “He is a boy in class five,” he was told. The guest was amazed: “Impossible! A child in class five could never write something like this,” he said. “Bring him here!” When Rinpoche arrived, they talked for a while and the guest went away most impressed. He later became Rinpoche’s sponsor. After he finished school, Rinpoche accompanied the Prince of Sikkim to college in Delhi, and afterwards to England, where he studied at Cambridge, and gained an unrivalled knowledge of the religious traditions in the East and West." In 1975 he taught two or three evenings a week in a private flat in Swiss Cottage. Between January and April he taught on meditation, the history of Buddhism, the teaching of the Buddha, and Tibetan language. The emerging group moved to premises in Chatsworth Road at the end of May. August 27th 1977 saw the Opening Ceremony for the Orgyen Chö Ling Centre in Kilburn, London. It was visited by His Holiness the Karmapa and Jamgon Kongtrul Rinpoche in November. September 28th 1978 saw the French sangha's first meeting at its centre in Rue Burq, Paris. In 1982, he requested and organized the teachings given in Paris by His Holiness the Dalai Lama at the Pagode de Vincennes. In 1989, Rigpa organized the historic teachings given by His Holiness the Dalai Lama at San Jose, and Sogyal Rinpoche gave the welcome address, congratulating His Holiness for being awarded the Nobel Peace Prize. He also served as a translator during the teachings. 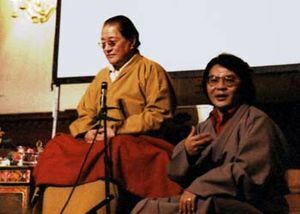 In August 1990, Sogyal Rinpoche and Rigpa hosted Dilgo Khyentse Rinpoche on his final visit to the West, together with an extraordinary gathering of masters at Prapoutel, a ski resort in the French Alps. In 1991, he founded the retreat centre of Lerab Ling near Montpellier in southern France. In 1992, The Tibetan Book of Living and Dying was published. Two million copies of this spiritual classic have been sold in 29 languages and 56 countries. It has been adopted by colleges, groups and institutions, both medical and religious, and is used extensively by nurses, doctors and health care professionals. In 1993, he appeared in Bernardo Bertolucci's film Little Buddha in the role of Khenpo Tenzin. In 2000, he welcomed His Holiness the Dalai Lama to Lerab Ling (see Lerab Gar 2000). In 2008, he welcomed His Holiness the Dalai Lama again to Lerab Ling. The Dalai Lama consecrated the Palri Pema Ösel Dargyé Ling temple and its main Buddha statue. Nyoshul Khenpo, A Marvelous Garland of Rare Gems: Biographies of Masters of Awareness in the Dzogchen Lineage (Junction City: Padma Publications, 2005), '15. The Students of Jamyang Khyentsé Chökyi Lodrö and Other Masters', Lakar Sogyal Choktrul Rinpoché, pages 462-463. ↑ Sogyal Rinpoche describes in some detail his first encounter with the Dalai Lama in his foreword to the book Dzogchen: The Heart Essence of the Great Perfection, by His Holiness the Dalai Lama, Snow Lion Publications, 2000. This page was last edited on 14 September 2018, at 08:53.